We are pleased to present the front cover of The Women’s Footy Almanac 2018! The Women’s Footy Almanac 2018! 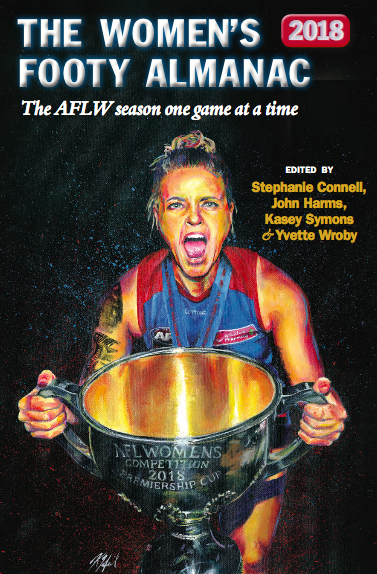 Painted by the incredible artist and VFLW player, Kendra Heil and designed by John Kingsmill, this is the cover of our book (to be launched in late July) which celebrates the second season of the AFLW and women’s and girls’ footy generally. The Women’s Footy Almanac 2018 book is now available for pre-order. (Details are at the end of this piece). Kendra has captured a raw and defining moment from the Western Bulldogs’ premiership win. Women’s Footy Almanac editor, Kasey Symons, caught up with Kendra to talk to her about her inspiration and process in creating this stunning piece of art. Kendra chose to paint Hannah Scott for more reasons than just depicting this incredible image that was snapped after the Dogs battled their way to premiership glory. ‘It’s a lot easier for me to paint somebody I know.’ Kendra says. On her process, Kendra says that intimate connection to the athletes in her art is important for her to bring her subject’s personalities and energy to life. ‘It’s a really intimate thing to do to spend that much time looking at a person in that amount of detail. So when I first started painting the Collingwood boys (while on the club’s list in the inaugural AFLW season), I went up and asked them first and got to know them a little bit before I painted them to make sure it was ok with them and I started painting people I know from different clubs because I know their story. It’s easier to bring out that emotion when I know who they are. You can see the intimacy in this piece. Kendra has brought out Scott’s raw emotion, her ferocity and explosiveness in an image that defines the Dogs’ season. After many set backs, injuries, a controversial suspension, the Daughters of the West never stopped snarling and history will remember their bark. Kendra was thrilled with how Almanac designer, John Kingsmill has transformed her piece into the cover for The Women’s Footy Almanac 2018 cover – and so are all of us here at the Almanac. Scott’s footy dreams certainly came true that cold and wet day in March and now, in a way, ours have too in being able to publish another book covering the women’s game and we would not have been able to do it without the support of our sponsors Think Agri, Ethical Investment Services, SC Lennon & Associates and Deakin University as well as our Women’s Footy Almanac patrons. And of course, all the writers who contributed their words. We can’t wait to bring you this book to very soon! To listen to Kasey’s full interview with Kendra, check out our latest podcast on The Footy Almanac stream. And to hear more from Kendra and from some other incredible women in the sport media space focused on the women’s game, come to our Women’s Almanac Pie Night on May 30 at the Fitzroy Bowls Club. Tickets are only $20 and include some pies, sausage rolls and a drink. All are welcome to what will be a great night talking footy with hot pies and cold drinks – we hope to see you there! Powerful. Congrats and thanks to Kendra. And John Kingsmill. Kasey has been doing a mountain of work on this book too. Fantastic … can’t wait to recap on another tremendous AFLW season and more …. Beaut – well done all! Magnificent cover. It really captures the emotion! Yippee!! Can’t wait to see it in print. Brilliant cover. Congratulations and well done to all contributors. Buy a few copies; give them to your mates. Looks superb, great job Kendra, well done to everyone involved! Straight to the poolroom for that one. Love it. What Smokie said. Can’t be in Melbourne for Pie Night but I’m looking forward to the pix!